Good cozy mystery with Holmes setting. Gemma Doyle is co-owner of the Sherlock Holmes Bookshop and Emporium and Mrs. Hudson’s Tea Room next door. Located in the small touristy town of West London Massachusetts, the bookshop sells all manner of Holmes books and miscellany. The Tea Room is run and co-owned by Gemma’s best friend Jayne. West London is also home to a small repertory company rehearsing Hound of the Baskervilles. The company has brought the famous (30 years ago) actor Sir Nigel from England to star. While hosting a pre-premiere tea party, Gemma finds Sir Nigel dead. With suspects and motives aplenty, this cute cozy keeps the reader guessing until the end. 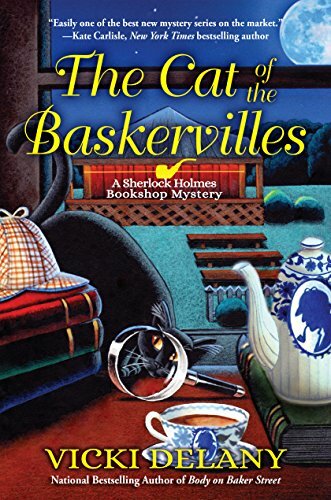 The Cat of the Baskervilles is the third in the Sherlock Holmes Bookshop series. However, it can read as a stand-alone. This book would have rated 4 stars except for two issues. The Cat in the title and even the Bookshop play almost no part in the story. Both held a more prominent role in the two earlier series entries. Secondly, a major clue to the denouement is reserved until the final few pages making it difficult for the reader to prove, rather than just guess, what happened to Sir Nigel. 3 stars.